Two items on Wednesday’s closed session of the Escondido City Council caught my attention, both property negotiations. First was the City’s property at 2269 East Valley Pkwy., and the negotiating party the American Heritage Charter Schools. That property is now leased by one of the Escondido Community Child Development Centers (ECCDC). I was concerned that, once again, the city was evicting a needy tenant to supply space for Heritage Charter. Sometimes it feels like I’m living in the movie Groundhog Day. The second negotiation was for a “parcel on the north side of West Valley Pkwy. between City Hall and the California Center for the Arts.” Negotiating parties: the City of Escondido, Craig Clark and Atwater Infrastructure Partners, LLC. The City Council’s Action plan did include trying to attract a downtown hotel. Looks like they’ve only received interest from Craig Clark again, for the umpteenth time. I wrote about this also: http://ablueviewescondido.com/2015/08/17/a-brief-history-of-the-downtown-hotel-dream/ . The regular Wednesday meeting had no surprises. The Staff had asked to pull Consent Calendar item #8: Notice of Completion for Fiscal Year 2014-15 Street Maintenance Project. They had a slide show of the improvements made. Councilman John Masson took the opportunity to complain about wastewater treatment regulations that will complicate the repaving of streets. 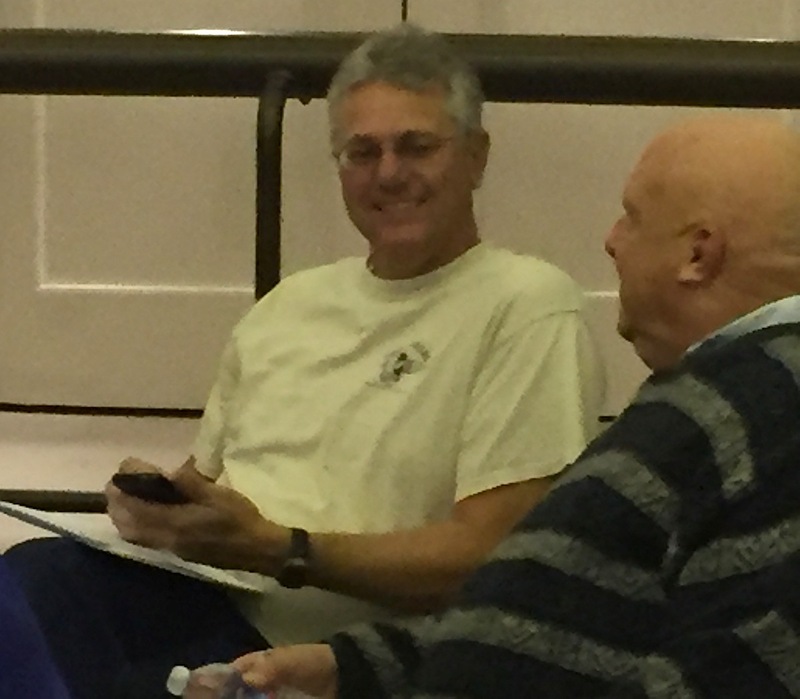 Escondido resident Robroy Fawcett (left), one of several citizens who comment regularly during council meetings. Robroy Fawcett asked to pull consent calendar item 9: “Employment Agreements – City Manager and City Attorney.” His basic complaint was that the City Attorney and Manager were paid too much, and that lead to paying the City Treasurer too much, since the Treasurer’s salary was a tied into what the Attorney and Manager were paid. He claimed that private sector professional salaries had taken a dip during the recession, but the public employees had not so suffered. Fawcett also pulled item 13: Extension of the ERTC Development Agreement. He claimed the ERTC was not able to market its properties, because there were significant problems with the way the land had been graded, and there were too many restrictions on the uses of the properties as demanded by the Palomar Pomerado Hospital District. It will be interesting to see what sort of proposition Craig Clark has for a downtown hotel this time around. How much will he ask the City to contribute this time? Watch this space.